Versatile NBA forward who was drafted 35th overall by the Golden State Warriors in 2012. He helped the Warriors win NBA Championships in 2015, 2017 and 2018. He was named to his first All-Star game in 2016 and in 2017, he was named NBA Defensive Player of the Year. He was a two-time state champion at Saginaw High School in Michigan. He was named Big Ten Player of the Year during his senior season at Michigan State University. He was raised with an older brother named Torrian Harris, who briefly played junior college basketball. In 2019, he got engaged to Hazel Renee. 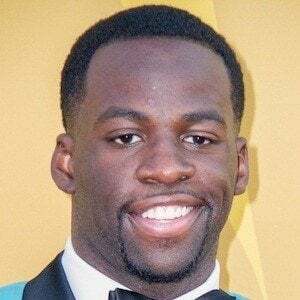 He has children named Kyla and Draymond Jr. from his relationship with Jalissa Hardy. He first took the court with sharpshooter Stephen Curry on the Golden State Warriors during the 2012-13 NBA season.